Yes, I'm at it again. 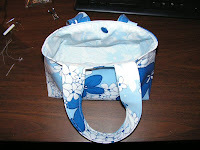 This time I've made a new purse. I haven't decided which city in Alberta I plan to name this one after to stick with my purse-naming theme (which will be noticeable once I actually finish that store website), but I LOVE the shape of this purse. I made a bit of a flaw in this one that is hidden in the way that I photographed it, so I'll need to make another... but now that I've made one, I know what I'm doing and the next ones will be even better :) I can't get over how much I like the shape and proportions of it. I think my next one will be a tad bit taller, however. 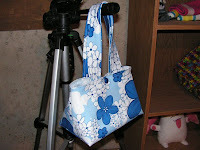 The purse is made from the same tropical blue canvas outer fabric and soft blue floral print cotton lining that I used to make the tote bag from last week that ended up being a wedding/honeymoon gift for my best friend's sister. I can't get enough of this great fabric! Now that I've found a new design I am in love with, I'm picturing all kinds of different fabric pairs that I want to try with this one. I think on my next go around I will reinforce the canvas a bit more with fusible interfacing just for added sturdiness. What do you think? Aww its adorable Did you use a pattern?? Thanks!! I tried out http://www.craftster.org/forum/index.php?topic=54769.0 but I really didn't like the construction. I took the "wing" design of that pattern for the sides and did something similar on my own modified pattern to achieve the triangle sides, so it could be technically a 'sha sha', but after making the first and not liking how it turned out just straight from the website, I made another (and updated the pics quickly after) and like the modified version a whole lot more. I've always wanted to figure out how to make the triangular sides! Hahaha that's awesome! It seemed easy to start making purses after making plushies since you make plushies inside out and flip them right side out to stuff, and purses are kinda made the same way. I make them inside out and then flip them right side out through the lining.